Lazaro Cardenas is a major seaport located in the state of Michoacan on the Pacific coast. Lazaro Cardenas is mainly centered on shipping, industry and business and is not a tourist destination per se. However, the city serves as a major gateway for travelers passing through on their way to the numerous Michoacan coast resorts. 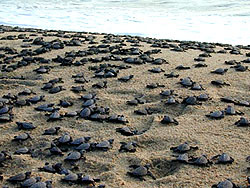 One nearby popular town that travelers frequent is Playa Azul which is located just 15 miles west of Lazaro Cardenas. The city was formerly known as Los Llanitos and received its current name in the 1970's in honor of Mexico's president from 1934 to 1940, Lazaro Cardenas del Rio. It was during the decade of the 1970's that the city's growth increased dramatically and its evolution into a major industrial port took place. Lazaro Cardenas is located about 240 miles west of Morelia, the state capital of Michoacan. Many travelers stock up on provisions before leaving Lazaro Cardenas. Many visitors to this area seek a calm and scenic vacation getaway and the Michoacan coast provides just that. It is known for its natural beauty and white sand beaches. The coastline here is sparsely populated and not overrun by glitzy hotels and fancy discos. The resort city of Manzanillo lies to the north and Ixtapa-Zihuatanejo to the south. 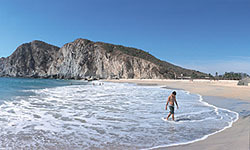 The Michoacan coast has great beaches for swimming and sunbathing. There are some incredible surf spots as well. The landscape is like a tropical paradise with coconut palms lining the road; mango and papaya orchards greet the eye and birds flitter and dance amongst the lush vegetation. Driving along Highway 200 which hugs the Michoacan coast, you will smile to yourself as you notice skunk, raccoon and armadillo-crossing signs. Breathing in the fresh sea air, you'll thank yourself for coming. By the way, this stretch of coast is known for its awesome sunsets; make sure you bring your camera along!